National History Day has announced that Dr. Greg Borchardt has been selected as one of 18 educators in the country to participate in their upcoming "Memorializing the Fallen: Honoring those Who Served" program. 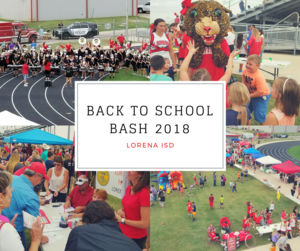 Our annual Back to School Bash will be held August 13 at 6:30 pm at Leopard Stadium. LHS students competed in the District UIL Academic Contest March 22. Many students placed and several advanced to the Regional competition. Kaci Donaldson represented LHS at the State Powerlifting Meet March 17th setting a new school record. Congratulations to our UIL Academic competitors! They took home 1st place in the district meet February 28th. Click above for individual results. Area superintendents gather to help pack meals for Pack of Hope to be distributed to students in their school districts. Congrats to Emily Jander on earning the Commended Scholar designation for her PSAT/NMSQT scores. The LISD School Health Advisory Council will be offering a presentation by the Lorena Police Department on Monday, January 29, 2018 on Drug Awareness. Students from Lorena Middle School & Lorena High School recently auditioned for Region Band.